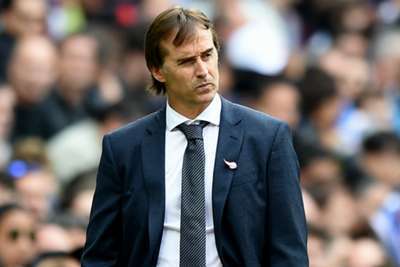 Julen Lopetegui insists he is "more motivated than ever" after Real Madrid's 2-1 home defeat to Levante on Saturday intensified claims he is on the verge of being sacked. Madrid were 2-0 down after just 13 minutes against Levante and, although they pushed desperately for an equaliser, slumped to a fourth defeat in five games across all competitions, despite Marcelo pulling one back 18 minutes from the end. Before the match, reports suggested Lopetegui would at least be given until after next Sunday's Clasico with Barcelona to save himself. That now looks less likely, but Lopetegui – who has only been in charge since July – is adamant he is not paying such speculation any attention. "Right now that is the last thing I'm thinking about," he told reporters after the match. "What I want is to get the boys back up as soon as possible and prepare them for the next match we have in three days [against Viktoria Plzen]. "I feel more motivated than ever to continue, because the team has left everything on the field. "Sooner or later we will get ahead. We know the injustice that football has had with us, but only the dynamic is changing. "The dressing room was sad, but with the desire to raise their heads and look at the next game. The team has given their all and is going to leave everything [out on the pitch] to get out of this situation."